Let's face it, the co-located teams mentioned in all of the agile methods just don't happen on many of our real-world projects. Sometimes, we just have no choice -- we have to work with team members in different cities, different time zones, or even on the other side of the world. How do agile methods fare under these circumstances? 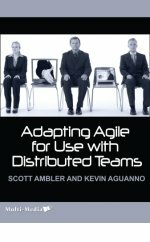 In this 60-minute interview with Scott Ambler, a noted author and speaker on agile methods, he discusses the latest statistics and some interesting examples of how large, distributed teams are adapting the agile methods to work in a globally-distributed team environment. Learn how to lower the communication barriers and improve project performance under these most difficult of circumstances. Theory is one thing, but practical application is another. Listen to this recording to learn how large companies are using agile methods successfully with distributed, virtual teams.